It's important for the NHL to grow the game, not its brand. Welcome back to This Week in NHL Stupid, where we track the ugly, the silly, and the just plain stupid in the world of hockey. This week, instead of looking back at the recent past, I want to gaze ahead to the future. This is absurdity that hasn’t happened yet, but is visible on the horizon. I want to get out ahead of the game and talk some potential stupid. Bettman went on to say that he expects that the league/players should be treated as a top sponsor, which involves financial compensation, to make up for any lost revenue and the disruption of the regular season. A few things here: First, I completely expect this declaration to not be the final answer, but rather part of the discourse between the NHL and the IOC. If Bettman and the owners truly didn’t want the players to go, it would have been a done deal and the announcement would have been made in January as it was supposed to be. I also get that this upcoming Olympics is on the other side of the planet in South Korea. It’s easy for hockey to be lost in the tape delay shuffle when the games are that far away. The Olympics can’t be in Vancouver and Salt Lake City every four years. That’s the key. It’s important to grow the game. 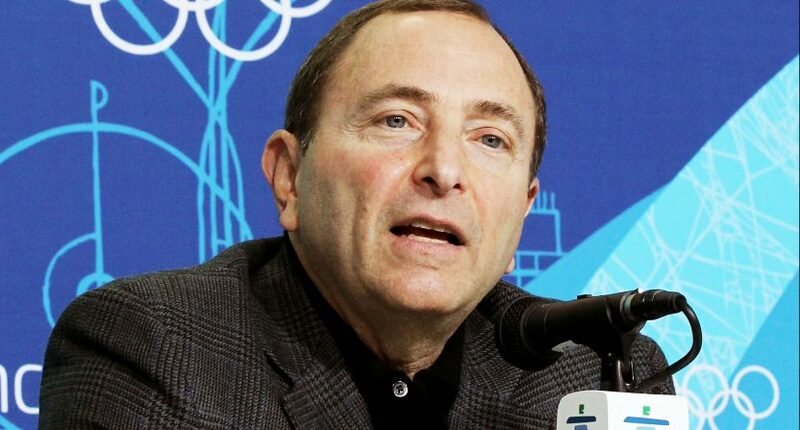 Bettman, meanwhile, has been talking about the Olympics costing the league content on television and social media. He’s concerned about growing the brand. That goes back to wanting “top sponsor” status, which I assume would allow the NHL to use Olympic video on their Twitter, Instagram, and other social media accounts, among other things. But the Olympics will always be the best opportunity to grow your game, even if the effects aren’t immediate. This league has Sidney Crosby, Alex Ovechkin, Connor McDavid and Patrik Laine… and they don’t want to expose those stars to a brand new audience in Asia? The owners are really going to pass that up for a few extra dollars on the front end? Because the World Cup of Hockey is just as good? This was the atmosphere in a bar on a Sunday morning at 10 a.m.watching T.J. Oshie’s legendary shootout goal against Russia… in a city where Oshie has never played his home games. There were scenes like this in bars all over the country. Now show me these scenes from the bars during Team USA’s game against Team Europe in the World Cup. All this, along with the mess you’re going to have when players like Alex Ovechkin go ahead and say “Hey Caps, I’m out” for the Olympics, and other players obligated to their NHL teams during these two weeks, is it really worth it to save two weeks of social media content? It would be stupid to throw a unique chance away for that. I hope it doesn’t come to that. Sidney Crosby is getting a little feisty. First, Crosby tagged Ryan O’Reilly in a sensitive area on Tuesday. But Sidney Crosby is too good a player to resort to that nonsense. Also, nobody will have any sympathy for a player who does those things when that player is the first to complain about such things happening to him. So whatever things that other players are doing to Crosby which may make him feel like he needs to resort to this, I still have very little sympathy for him. It’s amazing how bad the Avalanche have been this year, and it was certainly magnified this past week. First, the ‘Lanche had a 3-1 lead against Chicago on Sunday and somehow lost it in 34 seconds. Then on Thurday, they had a 4-2 lead on Edmonton, also in the third period. They gave up five (!) goals. That’s 0-4 in the past week for Colorado. The Arizona Coyotes of Glendale are 29th in the league with 63 points. They have 20 more points than the Avalanche. You think Patrick Roy knew what he was doing?